"Blind" Blake (born Arthur Blake, circa 1893, Jacksonville, Florida; died: circa 1933) was an influential blues singer and guitarist. He is often called "The King Of Ragtime Guitar". Blind Blake recorded about 80 tracks for Paramount Records in the late 1920s and early 1930s. He was one of the most accomplished guitarists of his genre with a surprisingly diverse range of material. His complex and intricate fingerpicking has inspired Reverend Gary Davis, Jorma Kaukonen, Ry Cooder, Ralph Mctell and many others. He is most known for his distinct guitar sound that was comparable in sound and style to a ragtime piano. Very little is known about his life. His birthplace was listed as Jacksonville, Florida by Paramount Records but even that is in dispute. Nothing is known of his death. Even his name is not certain. The copyright submissions for his songs use some variation on Blind Arthur Blake although there is a suggestion that his real name was Arthur Phelps. His first recordings were made in 1926 and his records sold well. His first solo record was Early Morning Blues with West Coast Blues on the B-side. Both are excellent examples of his style. Blake made his last recordings in 1932, the end of his career aided by Paramount's bankruptcy. It is often said that the later recordings have much less sparkle and, allegedly, Blind Blake was drinking heavily in his later years. It is likely that this lead to his early death. It should be noted that on a few records where white jazz guitarist Eddie Lang sat in with African American groups, the record companies listed Lang as "Blind Blake". 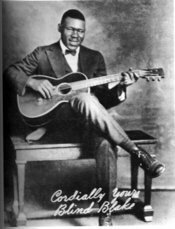 Most of those recordings, principally with Lonnie Johnson gave Lang the name Blind Willy Dunn.